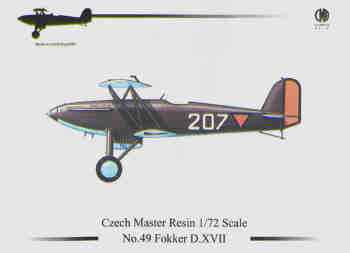 Czech Master Resin has deleted this model from their range as there are no more decals available and they did not find it economical feasible to have new decals printed. However, for Aviation Megastore they produced a small batch of the plain kits. Dutch Decal then created a whole new set of decals as well as instructions for this kit enabling the modeller to creat a Fokker D17 in LVA scheme either with roundels or with triangles. All serials are possible! The staff of Aviation Megastore put it all together and offers them exclusively!